To listen as if every secret of the universe was being spoken in a single moment. To listen with every aspect of our being. To listen to our nudges, as if they were loud, intolerable screams that could only be silenced by listening. To listen to others, as if God itself was speaking through them – directly to you. To listen to their words, what they say,what they don’t say, what they wish they could say. What does that say about you? About the space you hold for your brothers and sisters? sorrows, fears, cries for protection, shouted as they silently move their limbs. Hope, love, joy, seeping out in whispers,through their quick glances, their shy smiles, the wide eyes. How? How do they move? What? What are they saying? when we are, or are not, meeting their gaze. 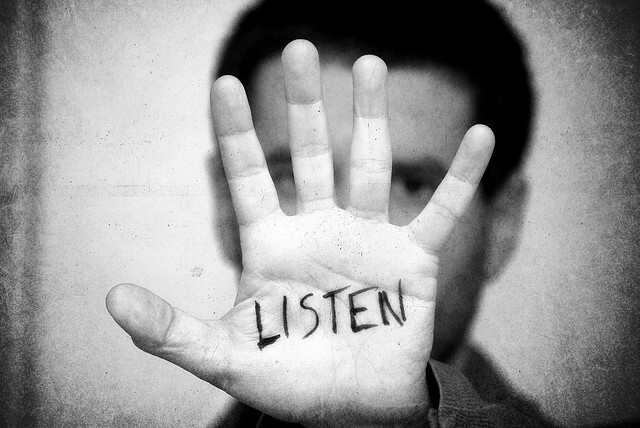 We must learn to listen as if listening was how-to-save-a-life. Listen, as if listening were a layer of skin, interpreting everything it touched, or was touched by. Listen as if the beating of your own heart depended on the directions that were whispered unto you. We must learn to listen as if there were no words, only riddles, left from source, holding all the wisdom from the beginning of time, to be deciphered in a single moment. This one, then the next. Lay your heart in your ears, in your eyes, in your pulse. Let everything be spoken to you, receive, everything, you need to know.